Sherlock Holmes is about the idea that you can start with an absurd set of data and work backwards, through a series of logical steps, to a completely reasonable starting place. (Many people have spotted that Sigmund Freud had roughly the same idea at roughly the same time.) Neither Freudian nor Holmsian methods would work in real life: Sherlock admits as much, though Sigmund never does. The cases that Holmes solves (or at any rates the cases that Watson bothers to write up) are exclusively those cases which Holmes methodology happens to work for. Which generally means closed-systems with something weird — or as Holmes always says, singular — about them. Give him a guy whose been killed in a remote country house after swearing he saw the ghost of a hell hound, and Holmes has a fair chance of sorting things out. Pull John Doe’s body out of the Thames three months after it got there, and boring old forensics are a better bet. Deduction is where you start from a premise and work out what the conclusion will be. Starting from a conclusion and working back to the starting point is induction. You would have thought Holmes, or at any rate Watson, or at any rate Doyle, would have known that. Not all the stories work: but in the ones that do, there is a real joy in seeing Holmes impose order on chaos; in saying “Of course: the club which you can only join if you have a particular kind of hair; or the bedside drawer with the hair of two previous occupants in it now makes complete sense. Clever Sherlock.” There is a similar joy in reading Freud’s case histories. Who cares if he never actually cured anyone. Holmes is a remarkable chap, obviously; Watson calls him the best and wisest man he ever met, which is not insignificantly what Plato said about Socrates. But he isn’t a superhero. Part of the point of the stories is that his deductions are plausible; anyone could do it if they kept their wits about them. We are inclined to think that Watson is a bit of a twit for not keeping up. A detective story wouldn’t be worth reading if the detective were that good. Ideally, Gentle Reader should get to the conclusion just after Holmes and just before Watson. 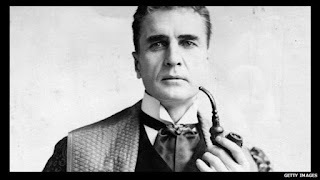 Holmes often has information that we and Watson don’t have, which a classical Whodunnit writer would regard as cheating. The Moffat / Gatiss Sherlock TV series has always been a slightly odd confection. It uses the now-superhuman inductive skills of Holmes in much the same way that the now-infallible navigation of the TARDIS is used in Doctor Who: as a pretext for (on a good day) brilliant, non-linear narratives and (on a bad day) for just abandoning cause-and-effect storytelling as a lost cause. Cumberbatch plays a kind of parody or race-memory of Jeremy Brett’s Holmes, which was itself a parody of Holmes as he is in Study in Scarlet and hardly anywhere else: crazy, misanthropic and not yet humanized by the arrival of Robin the Boy Wonder. 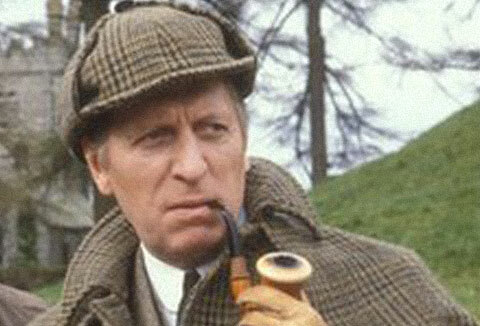 It correctly spots that the real fun in Sherlock was not the bobbies and the fog and the hansom cabs; or the funny pipe and the funny hat and the slippers. It was all about the logic and the mysteries. But convincing, Doylish mysteries — crazy end-points to which Holmes can provide convincing back-stories — are hard to write. Not impossible: the sub-plot about the dead son in the car in the Six Thatchers is the sort of thing I would like to have seen more of. But Moffat and Gatiss increasingly fall back on the lazy writers' worst cliche: the clever guy solving bizarre riddles which an even cleverer guy is consciously setting for him. Doyle’s Moriarty is a brilliant man turned into a brilliant criminal. Moffat's Moriarty is simply a lunatic. From Don Quixote to Hannibal Lecter, fictional lunatics can be the subjects of interesting stories. But they are a very lazy plot device. Why is he is doing this? Why is he going to all that trouble? How did he escape from the escape proof prison? He doesn’t have to have a reason. He’s a lunatic. Moffat’s Moriarty could very easily be imagined painting clown make up on his face and releasing poisoned balloons over Gotham City. The Final Problem (TV episode) produced newspaper headlines about “How the TV phenomenon became an annoying self parody” and “Missing persons inquiry launched as Sherlock vanishes up own arse”. But it seemed to me to have very much the same strengths and weaknesses as all the other episodes. It sets up a very interesting villain whose only function turns out to be to set up problems for and experiment on Sherlock Holmes. 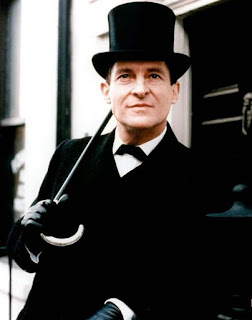 In a proper story, some believable chain of events would lead to a situation where Holmes has to choose between killing his brother Mycroft and killing his best friend Watson. Having a super-villain put them in a room and say “You must now choose between killing your brother Mycroft and killing your best friend Watson” is barely a story at all. It’s more like a Dungeons & Dragons puzzle. (The solution is straight out of the Hunger Games.) The deductive power of Holmes and Moriarty and Mycroft and the Mysterious and Unexpected Villain Who is Even Cleverer Than Any Of Them is not something that any normal person could keep up with. The cleverness of Holmes has become another manifestation of our old friend The Plot. Anything that the writers want to happen can happen because Holmes can make it happen because he is so clever. Add a non-player character who is as clever as he is, and then another one, and then a third one, and what you are watching is no longer detective fiction; it's a competition to see who has the biggest Sonic Screwdriver. "Annoying self-parody" isn't a bad description of the whole project actually: maybe I'd have gone for "clever, engaging but annoying self-parody." Most of us now expect a TV series to have some sort of forward momentum. Gone are the days when the BBC could put all three seasons of Star Trek tapes in box, shuffle them up, pick one out at random, show it on a Monday night and no-one would notice the difference. We now expect characters to die and get married and have babies (not necessarily in that order), partly because soap opera has replaced the novel as the dominant genre, and partly because verisimilitude. If our hero doesn't have the scars from the end of last week's thrilling adventure at the beginning of this week's thrilling adventure we won't be able to suspend our disbelief. 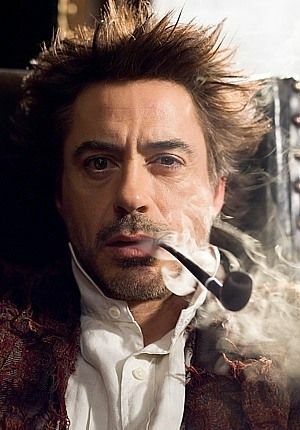 Sherlock Holmes had a brother. He had an arch-enemy and a landlady. These characters are so peripheral to the canon that we could very nearly say that they don’t exist. Moffat and Gatiss create entirely new characters with similar names, and present us with something that superficially feels a good deal like classic Holmes: Mycroft is clever and mysterious, Moriarty is evil, Watson misses the point and writes it up on his blog, and Mrs Hudson makes them all a cup of tea. But once you have shouted “go” and allowed events to start happening they stop being clever 21st century takes on 19th century ciphers and end up as the sum total of the last thirteen episodes. Which gets us very quickly to a Sherlock which has nothing much to do with Sir Arthur Conan Doyle's Sherlock Holmes. You may or may not have a problem with that. A similar process killed off the Marvel Comics “Ultimates” line. Issue #1 of Ultimate Spider-Man re-imagines Peter Parker as a 15 year old computer nerd from 2001; and we all said “wow, you’ve come up with a precise 21st century analogy for what made Spider-Man so great in the 1960s”. By issue #75, New York has been destroyed, J. Jonah Jameson is a goodie and Spider-Man is member of the X-Men, dating Kitty Pryde, on the run from SHIELD and dead. You can barely recognize him as Spider-Man any more; and the comic is just as hard to "jump aboard" as the fatally compromised Marvel Universe version. But the alternative is a 1950s sit-com where nothing ever happens and no-one ever gets any older. I suppose that Sherlock was always going to be the kind of series that some people would over-love, and, therefore, when it started to disappoint, the kind of series that some people would over-hate. I never loved it that much (apart from the Victorian special, which was genuinely clever) but I never hated it that much, either. It is clear that Stephen Moffat can only write one character: you could swap the Cumberbatch Sherlock with the equally interchangeable Smith and Capaldi Doctors and no-one would really notice. But that one character is a lot off fun. Matt Smith was my favorite non-canonical Doctor Who, after all. The clash of Cumberbatch’s over-the-top theatricality with Martin Freeman’s toned down naturalism (so underdone it’s practically not there at all) makes for consistently good scenes. The two of them would be riveting in any context: apart, obviously, from the Hobbit. Kudos to Gatiss and Moffat for realizing that Holmes could be taken out of Victorian London and still be Holmes. But how typical that when the smog and the urchins and the rats were cleared away, what was found to be left was not a man who cleverly worked backwards from the end of the story to its beginning; nor even a man eschewing emotion but guided by rationality. No: what Sherlock Holmes turned out to really be about was the friendship between Sherlock and John. It’s like one of those trailers where some Hollywood luvvie has been persuaded to appear in a low budget docudrama about William Ramsay and the discovery of the nobel gasses. There is a thing which Moffat and Gatiss do: and Sherlock Season 4 is Moffat and Gatiss continuing to do that thing. Disappointment, or even anger, seems curiously misplaced. It is what it is. Too many adaptations try to turn Holmes into an "epic", superhero character in an epic superhero story. Doyle tried to make Holmes a superhero in "The Final Problem" and it was possibly the least convincing thing he ever wrote (aside from "The Empty House"). Holmes is a creature best suited to short stories (with small-scale and simple plots built around a single clever twist each); not novels, movies, or near-movie-length TV episodes. Very few adaptations have managed to figure this out. I'm pleased to find that video I uploaded five years ago is still going around. Incidentally, a different Russian TV channel did a similar parody, which isn't quite as funny but does include the 2013 Russian series as another Holmes to mock. What I found most sad about the last episode was the very tired Bad Seed trope. Imagining the Holmes' family life and early childhood could have been amusing, but I figured out who the Big Bad was about half-way through "The Lying Detective," and that killed most of the joy for me. I had the reputation of being too smart for my own good at that age (it's a particularly damaging label for a girl), and I think it's a really cheap way to create a monster. It did indeed. Which I found very strange because whatever The Final Problem might or might not have been a parody of, it certainly wasn't the preceding twelve episodes, with which it had almost nothing in common other than the names of the characters. Regarding the series as a whole you can put me firmly in the camp that has no problem with Moffat and Gatiss's Sherlock having little to do with Conan Doyle. Perhaps not coincidentally, I am also very firmly in the camp that has no problem with Matt Smith's Doctor Who having little to do with William Hartnell's, or indeed Sylvester McCoy's. I am more than happy for clever writers to take the mythic elements of a long-running narrative and use them as the raw ingredients for something new. You're right about the poverty of the super-clever-bad-guy-sets-puzzles-for-clever-good-guy plot, though. I've never read any of the Ultimate Marvel comics. But it strikes me that series that reaches as far as the 75th issue before it's said all it has to say is really not doing too badly. In the same way, if Sherlock has now reached the point where it can't really continue without either repeating itself -- well, a series of thirteen episodes, each about the length of a feature film, is a pretty darned good run. FInally ... Smith and Capaldi interchangeable? Come, now. And finally, finally: has Martin Smith ever been anything that he didn't make twice as good by his presence? If you doubt that contention, just image the Hobbit movies with someone else -- Elijah Wood, say -- in the title role. Is it really that absurd, though? 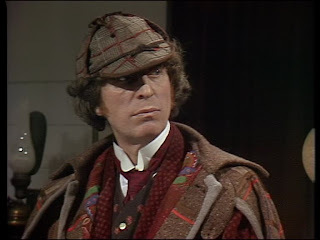 It seems to me that the criteria which makes Holmes a good detective could be just as easily be applied to being a good doctor - Doyle's chosen profession. Problem is, Holmes' particular skill-set is largely redundant in modern-day London, hence the need to exaggerate it (and maybe to place additional emphasis on his bromance with Watson). I can see the temptation of blaming plot inconsistencies on your villain, and wonder what you'd call it - Malus ex Machina, maybe? Is it really that absurd, though? 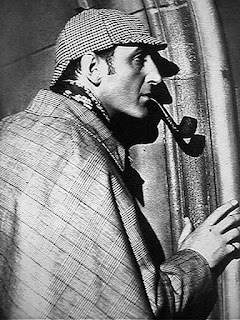 It seems to me that the criteria which makes Holmes a good detective could be just as easily be applied to being a good doctor. Shame Paul Attanasio and David Shore got there 13 years before. Or maybe it was the other way round? Maybe'House' was inspired by Holmes? I reckon Doyle's big idea was taking something we're all familiar with (him in particular) - a doctor diagnosing an illness - and putting it in an unfamiliar context: instead of symptoms, we have clues, instead of an illness, we have a crime, etc. Obvious, yet inspired. I rather think that was my point. Aonghus, possibly you already knew this but Doyle literally based Holmes' deductive abilities on one of his own medical professors, Dr. Joseph Bell. Doyle definitely believed that Holmes' techniques were practical in real life, and that what he had written was only a slight exaggeration on Bell's own abilities. I indeed hear about Bell, Swamp - but that's interesting re how Bell had a certain amount of faith in Doyle's concept. I'm guessing that Doyle's own experiences as a doctor helped, too. For me this piece brought on a strange combination of absolute agreement and… you know, the other one. It was the Victorian special I found to be the shark-jumping moment, and this latest series just part of a downward spiral for something already pushed into free fall. As I believe your good self has said before, Moffat and Gatiss’ scripts rely more on a kind of dream logic and symbolic association than anything an old square like me would call plot development. And that was always going to make for a poorer fit for Holmes than for Who. So quite an effective ending for ‘Who’, the monster turns out to be a lost lonely child, becomes absolutely risible when transplanted into ‘Sherlock’. Quite so. Which makes the scene where he solves the Song of Sister with lots of fast-forward writing on the screen so self-parodic. Its deductive reasoning reduced to a spectator sport. There might as well be a scene where we’re supposed to be impressed by Sherlock speaking Swahili, without any real way of knowing whether he is speaking Swahili or not. Which seems kind of central. When we’re told repeatedly that Sherlock is so, so clever without any effective demonstration of this, we’re effectively being told that Moffat and Gatiss are so, so clever. Writing which impresses you with its own cleverness is, admittedly, not much of a thing for me. I don’t see much point in script-as-puzzle. I mean, you could just have a puzzle, couldn’t you? But writing which seeks to impress you with its cleverness while not actually making much sense seems to me the worst of both worlds. So we’re told Bad Sister is a mastermind, yet she comes up with an absurdly convoluted plot which defies all logic. Why go to all that trouble of donning disguises to push Sherlock into another (entirely unrelated) case and flirt with Watson on the bus, what did it have to do with anything? And if she wants to lure him to Lecter Island why try to kill him off before he’s even left London? And why write in that pointless scene if you don’t even have a convincing escape plan for your characters? I get, before anyone comes in and says so, that Bad Sister is supposed to be The Bad Side of Sherlock, who treats us mortals as disposable playthings and cares only for solving mysteries not justice or public safety, with whom he first contains and then becomes reconciled to the point they can play a duet together. But it could still make sense at a surface level. Or, even if it couldn’t, it could stop pretending quite so insistently that it does and it’s our job to keep up. It's really interesting what you say about Gatiss and Moffat, Gavin. I've only ever watched 'Doctor Who' sporadically (I never saw any of the episodes in which Matt Smith featured, for example) and only realised that I've been mixing up the two writers, maybe because - as you point out, they have certain things in common (emotional logic rather than plot logic being a key example) - and I particularly remember 'The Empty Child' because I actually thought it was a stand-out episode and felt this was partially due to the fact that Gatiss hadn't written it. I'm not necessarily knocking Gatiss: I think being the primary author in such a series is invariably going to expose your tropes as an author. It's interesting how subsequently Moffat has developed his own line of tropes and how I would now find it hard to distinguish one author from the other. I saw the first series of 'Sherlock' and enjoyed it. If you were familiar with the stories, recognising what the author had done with such well-worn material was a lot of fun. I then saw the Xmas episode, which I thought was terrible - but appreciate this might be a matter of context: ie, that it probably plays around with themes explored in episodes I missed. Well, Aonghus, that is pretty surprising to me, given that his performance was by some distance the best thing about those films. Perhaps one could argue that the very fact you don't remember it as a performance shows how believable it was. More of my thoughts on Freeman as Bilbo in the first film here. I thought Freeman was excellent - and as you say, he usually is - but I don't remember Martin Smith, who I'd know - and then only by reputation - as a musician. I'm guessing he was one of the dwarves? In that respect, I thought Ken Stott turned in a very decent performance. Haha, OK, I see what I did there (and what you did)! Sorry, my dumb typo. For the avoidance of doubt, I did of course mean to say Martin Freeman. I kept thinking of that scene in the office - you know the one about Chuck Norris? Re 'Sherlock', I remember somebody - a director - saying that casting Watson is always a lot trickier than casting Holmes, so the series was lucky that Martin Freeman came along when he did. He was a perfect fit as Bilbo, although - as you said in your blog - it would have been nice to see something more true to the spirit of the original book, even if this meant it being inconsistent with the rest of the franchise. I'd forgotten that scene. Thanks for the reminder -- here it is. Tim's silent responses in the background are priceless. Very true on casting Holmes and Watson. It is essentially easy to act weird, which is what Sherlock needs to do. But to act normal: that is an art, and very very few people can do it well. It's a great scene. Like you, I was fixated by Tim rolling his eyes in the background.